Did you hear the one about the Vampire, the Were, the Shifter, and the Barmaid? In this final Sookie Stackhouse novel, Sookie discovers she has many enemies. One group decide to frame her for murder. Another group decide to just murder her. Another decides to steal her boyfriend. Her friends have other ideas about letting any of that happen without a fight. 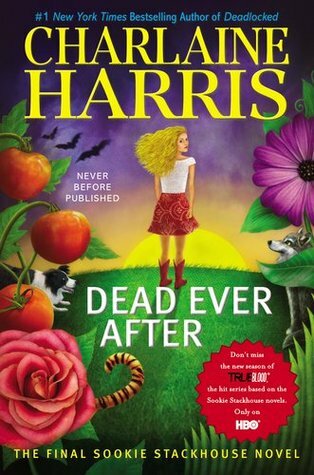 I haven’t been closely following Charlaine Harris’ series. I’ve enjoyed all the instalments I’ve read so far, and Dead Ever After was no exception. Although, I was surprised to discover this was the final novel in the Sookie Stackhouse series. * This felt like any other instalment in the series to me. Apparently fans of the series were annoyed with the less than satisfactory ending. A lot of one star reviews have been thrown at this book. One thing seems clear, Sookie didn’t end up with the right guy. Apparently. So if you are an invested fan, this book will probably be used to heat your home in winter. For the less invested fans, this will be regarded as a solid instalment to the series. *Yes, I can see the tagline on the bottom of the cover. Kinda hard to read when it is thumbnail sized though. I liked the show for a while. I think I watched two seasons. But it gets generic pretty quickly. The books are pretty similar in tone and style, if that helps.